W3C has announced a significant update to W3C’s internationally-recognised Web Content Accessibility Guidelines which addresses accessibility of web content, websites and web applications on desktops, laptops, tablets, and mobile devices. Web Content Accessibility Guidelines (WCAG) 2.1 expands upon guidance developed by W3C’s Web Accessibility Initiative (WAI) over the years, and is used widely around the world to make web content more accessible to people with disabilities. InterAccess are very happy to have been a part of the development of this standard, in Josh’s capacity as co-chair of the Accessibility Guidelines Working Group for the last 5 years. We are very happy to see the standard ‘live’ and confident that it is a positive and useful development of WCAG that will help many more people of diverse ability use the web. So what does WCAG 2.1 do? WCAG 2.1 expands existing coverage of mobile accessibility, and adds more provisions in the areas of low vision, and cognitive and learning disabilities. As with WCAG 2.0, following these guidelines will make content more accessible to a wider range of people with disabilities, including blindness and low vision, deafness and hearing loss, limited movement, speech disabilities, photosensitivity, and learning disabilities and cognitive limitations. Following these guidelines can also make websites more usable for all users. 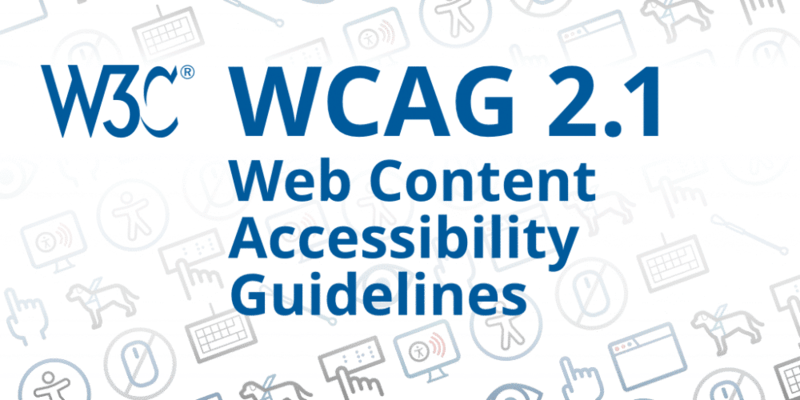 WCAG 2.1 updates WCAG 2.0 and expands W3C’s accessibility guidance, while maintaining W3C’s standard of implementable, technology neutral, objectively testable and universally applicable accessibility guidance. All new provisions have been tested in implementations across different types of websites and web content. The Working Group has taken care to maintain backwards compatibility with the internationally-recognised WCAG 2.0, in that websites that conform to WCAG 2.1 will also conform to WCAG 2.0, which remains a W3C Recommendation. WCAG 2.0 was designed as a highly stable, technology-agnostic standard, and has been kept relevant through updates to informative supporting resources. As with WCAG 2.0, WCAG 2.1 is supported by an extensive library of implementation techniques and educational materials, including Understanding WCAG 2.1 and Techniques for WCAG 2.1, which have been redesigned and moved to a different format to allow WAI to continue to update these on an ongoing basis. WCAG 2.1 has received wide support from industry, including accessibility-focused businesses, the disability community, research, education and government, as shown in the accompanying testimonials. In addition, W3C is coordinating with national and international regions updating their standards and policies, including the current update of the European Norm (EN) 301 549, which has been undergoing its own independent review process.